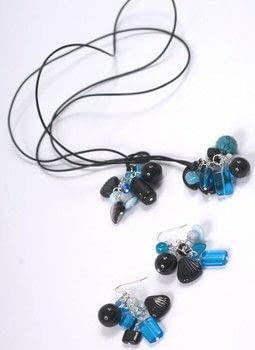 This is an easy to make necklace with lovely results. It looks fab worn casually with jeans and a plain black T-shirt. holding the jump ring on 1 side between your thumb and forefinger. Grip the other side with the pliers and open it away from you. Attach 2 jump rings and close the open jump ring. Open another jump ring in the same way. Attach 1 jump ring to it. Then attach the open jump ring to an end jump ring of the 3 you’ve already joined. You should now have 5 jump rings joined in a chain. To hang your beads, pick up a headpin and slide on 1 or 2 beads of your choice. Directly above the bead, bend the headpin over. Leaving a good centimetre, cut the headpin with the cutter part of your pliers. 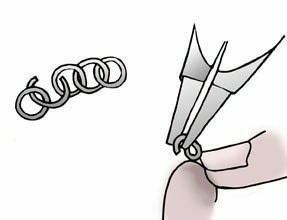 With the round nosed part of your pliers, curl the headpin into a loop until it is almost closed. Hang on any of the jump rings on your chain of 5. Close the headpin curl. Repeat this with 11 more beads, hanging them randomly on the jump ring chain. Repeat steps 1 and 2 to make a second cluster. cluster to the other ‘open’ ends of the leather. Do this by passing the 2 ends through the end jump ring and tying securely. 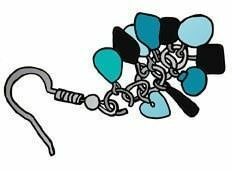 Following necklace instructions steps 1 and 2, make 2 clusters of beads. Open up the top jump ring of 1 of the clusters. Hang on the joining loop on 1 of your long ball wires and close the jump ring. 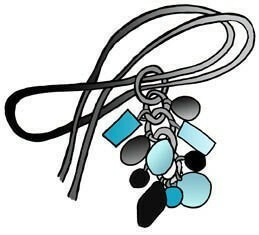 To complete your earrings repeat with the remaining cluster on a 2nd long ball wire. Your finished items should look something like this. :O thats pretty i wanna make somethink like that!